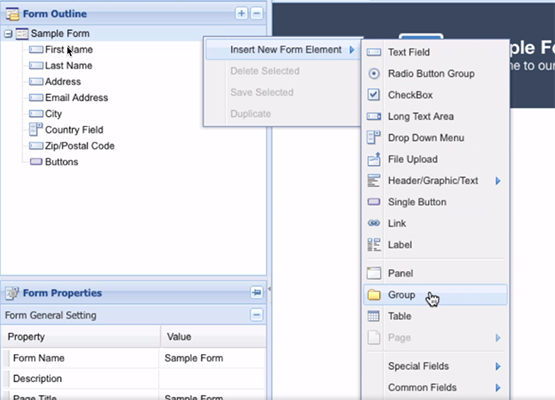 Depending on your requirements, you can create as many columns on your form as necessary. There are two options for creating multiple columns: Groups or Tables. Groups are invisible elements for gathering fields into collections. You can nest groups inside one another and then set the Alignment property for the group to govern the alignment for all of the elements within the group. When the Alignment property for a group is set to Vertical, all the elements within the group will align vertically. When the Alignment property for a group is set to Horizontal, all of the elements within the group will align horizontally. Important: Keep in mind that the elements within a group will wrap at the point they exceed the maximum width and that the group width is bound by the width of the form (or parent container). In the Form Workspace, insert a new group and give it a Name, say, Layout Container. Set the Alignment property of the group to Horizontal. Add a child group and give it a Name, say, Column 1. Add another child group and give it a Name, say, Column 2. Notice that the two inner groups within the layout container are aligned side-by-side because the Alignment of the parent layout container is set to Horizontal. Here we have the two columns which we set out to create. Finally, add elements to both the left and right group. Of course, you can extend this example to add a third column or more. Keep in mind that the columns will wrap to the next line if there is not enough space available to be displayed horizontally. See troubleshooting layouts for more information.